Fight the cold weather with a bowl of this simple, flavorful Slow Cooker Italian Wedding Soup! It’s February in Minnesota which can only mean one thing: it’s freezing. Fortunately I’ve lived here long enough to know that the best way to fight the cold is to bring the heat – or hot soup, in this case. 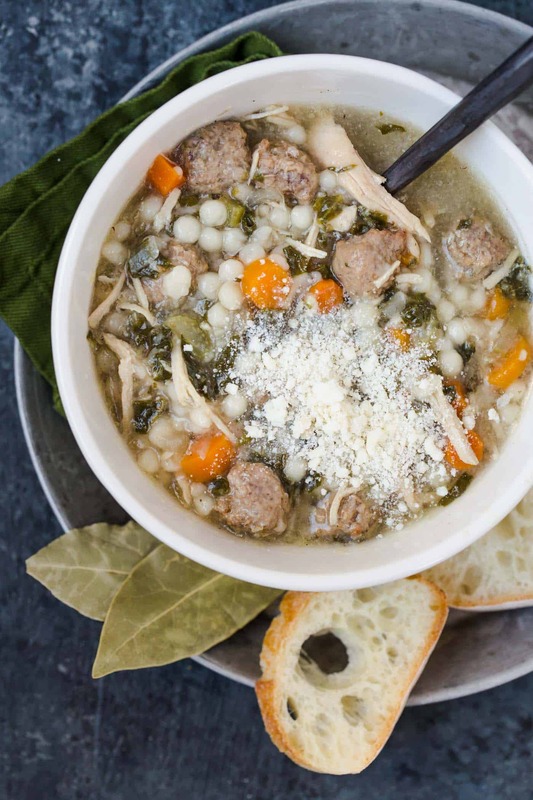 And this Slow Cooker Italian Wedding Soup simmers into soul-warming perfection all day long with no more than 10 minutes of effort on my end. Homemade soup can feel intimidating. 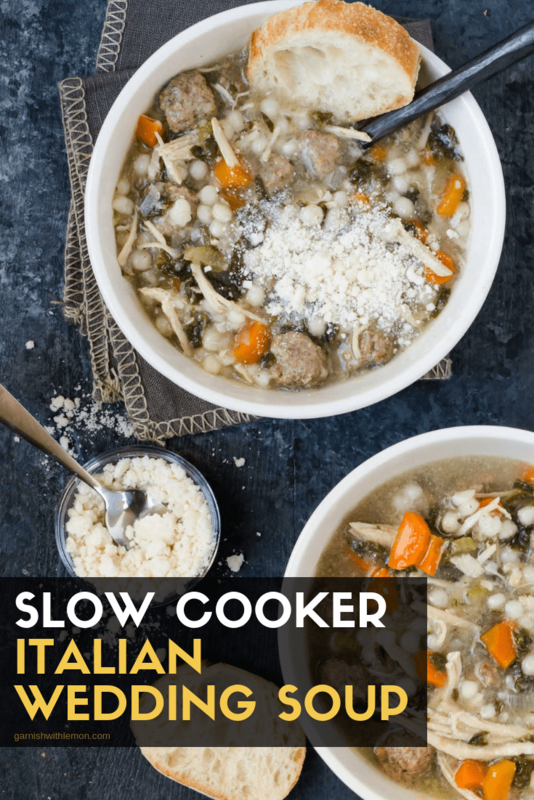 But this Slow Cooker Italian Wedding Soup ups the ante with minimal prep time and hands-free cooking in the slow cooker – two attributes that make it hard to resist. I guarantee that if you like chicken noodle soup, you’re going to love this recipe. What is Italian Wedding Soup? Where does it get its name? My friends at Wikipedia tell me that Italian Wedding Soup is actually the result of a mistranslated Italian language phrase for “married soup”, which refers to the fact that green veggies and meats go well together. I can’t speak to the validity of the translation, but I’ll definitely attest to its goodness! No need to stand for hours by the stove to make homemade soup. This slow cooker version makes quick work of putting steaming bowls of delicious soup on the table with minimal effort. And I do mean minimal when describing the effort involved here. Dump the first 10 ingredients in the slow cooker and let them simmer away all day. All that’s left to do is add the pasta and spinach about a half hour before serving. I always serve this soup with a generous topping of salty Parmesan cheese and warm baguette slices, but both of these are completely optional. What kind of pasta do I use in Italian Wedding Soup? This recipe calls for Israeli (or pearl) couscous because it’s easy for me to find at the grocery store. You can also substitute in acini de pepe, ditalini or any other small pasta you have on hand. You can easily freeze this soup! Most soups freeze very well, and this Slow Cooker Italian Wedding Soup is no exception. I like to portion my soup individually before I freeze it to make it convenient for me to pull out just the amount I need. Remember when you freeze liquids they will expand when frozen, so leave a bit of head room at the top of your container to allow for that expansion. For best flavor, plan to use this soup within four months of freezing it. Tip: I found these adorable mini-meatballs in the frozen section at Target. I think they are aimed at little kids, but their small size is perfect in this soup. No worries if you can’t find them. Regular-sized frozen meatballs work just as well. Stay toasty all month long with a variety of slow cooker soups! 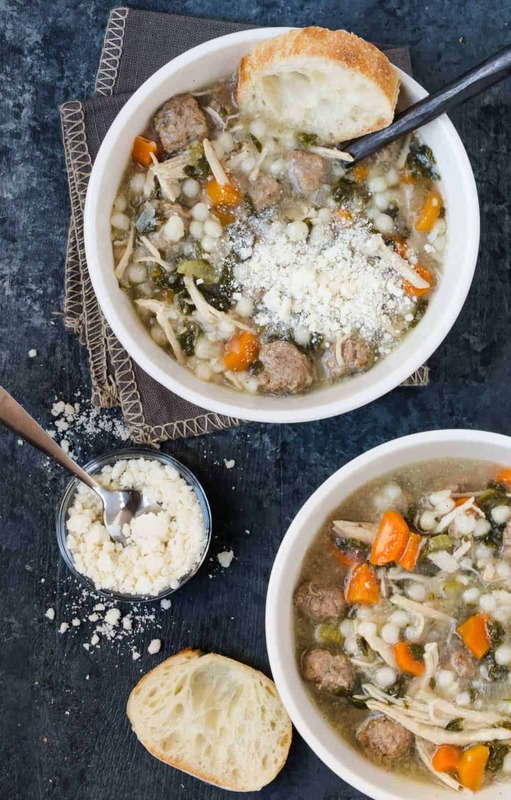 Take the chill off winter with this Slow Cooker Italian Wedding Soup recipe. A warm, hearty meal doesn’t get much easier than this! Place first 10 ingredients (meatballs through chicken broth) in a large slow cooker and gently stir to combine. Cook on low for 7 hours. Remove chicken breast from slow cooker and shred meat. Return chicken to slow cooker and add spinach and couscous. Cook for another 30-45 minutes. Season to taste with salt. Serve warm and top with Parmesan cheese, if desired. I SO cold here too here in the UK! So I definitely need to try this soup, it sounds so comforting and warming! Love the flavours! Thanks, Jess! Hope you warm up soon! A quirky name for tasty soup. Works for me! What a great soup for this winter – I think my son would really like this – pinned! Thanks for the pin, Jeanette! What a great recipe. Being Italian I always thought this was called Italian wedding soup because it was the only soup served at Italian weddings when I was growing up. I’m glad we don’t have to limit the goodness to just weddings, Linda! Totally agree: put “soup” and “slow cooker” in the same sentence and I’m all in, too. Makes life so much easier, doesn’t it? Thanks, Jameson! This is absolutely one of my favorite soups! I love that you added couscous and made it in the slow cooker! Hope you enjoy it, Katie! We’re cold here in the Chicago area too! Love soups in January. Italian Wedding Soup is one of my favorites and I can’t wait to try it in the slow cooker. YUM! Should warm you right up, Christine! I love Italian Wedding Soup–the idea of doing it in a slow cooker is great! Yay for slow cooker love! Ughhhh we’re in the midst of FREEZING cold as well, it’s awful. The only thing that’s keeping me warm is hot oatmeal in the morning, fires and lots and lots of soup. This is the perfect warm-me-from-the-inside soup — I NEED this! I love soup. I love this kind of soup. The slow cooker is my friend! Great recipe. Thanks, Carol! We loooooove our slow cooker, too. Especially when it cranks out some tasty soup! This reminds me of Christmas dinner! We have it every year! Def my fav soup! Looks delish! Love that it reminds you of a special time! Yay! Hope the family loves it as much as mine does!